Description A black and white photograph showing a group of railway men standing on the Picton railway station platform. Along the bottom of the photograph is: "Railway Station, Picton 1875. There is a telegraph pole behind the station. 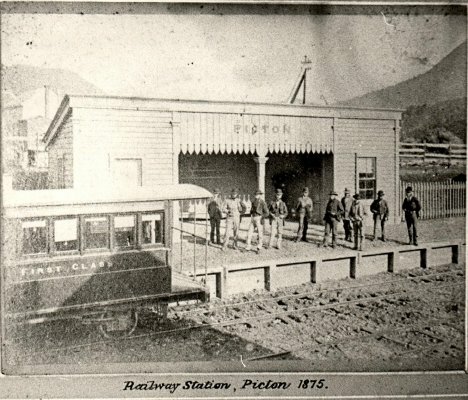 Information on the back as written by Norm Brayshaw: "Railway Station at Picton 1875. This would be on present foreshore[.] Picton Blenheim authorised by Railways Act 1871[.] Sir Julius Vogel was one of six railways contracted for by Brogden and Sons in December 1871. Completed to Opawa River in 1875 [w]here a station was erected for Blen[heim] line formally opened for traffic 1875 (Nov[ember] 17th)[.] Two locomotives named Blenheim and Waitohi[.] Refer 'Pages from Past' Nos. 291. 292. 293." Copied for the Histrical Exhibiiton in 1959 by Norm Brayshaw from a photograph held by A.M. Hale, Blenheim.